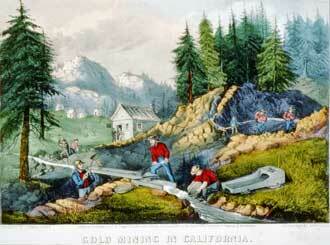 Currier & Ives, a firm of American lithographers, was prominently active during the 19th century. The firm developed from the business founded in New York City by Nathaniel Currier (1813-88). In 1834 Nathaniel Currier, who had learned lithography from the Pendletons in Boston, formed a firm which later became Currier and Ives when James M. Ives becoming a partner in 1852. In the mid-nineteenth century, most of the lithographic crayon work was printed on hand presses. 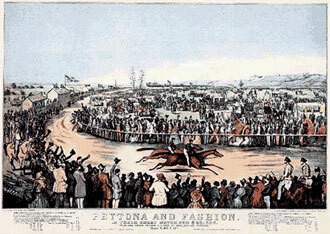 The Currier & Ives firm, which made a specialty of racing scenes, used hand presses after which the black prints were then hand-colored. It has been estimated that Currier and Ives produced more prints dealing with horses than the four hundred other lithographers at the time put together. Trotting, running, or standing still, the horse was a symbol of the American desire for speed, which was its heritage to the age of the automobile. Currier & Ives antique prints varied in size from approximately three by four inches to eighteen by twenty inches, and in price from 6 cents to three dollars. The firm also made and sold the popular Currier crayons used by lithograph artists. Currier's first successful prints depicted destruction from fires. From the beginning Currier combined a pictorial sense with an instinct for the news value of his prints, and the most popular at the start were those depicting fires with lurid flames and heroic firemen. 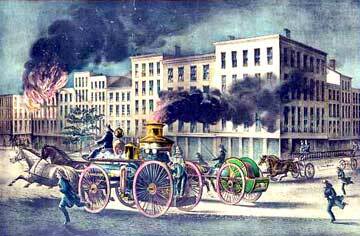 The burning of the Planters Hotel in New Orleans was the earliest of these prints in 1835. Another print, the “Awful Conflagration of the Steamboat Lexington” in 1840, was an arresting representation of the fire on the Long Island Sound that destroyed a large part of lower Manhattan. 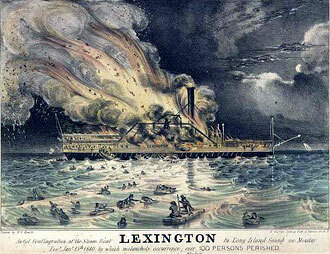 This lithograph appeared three days after the fire as an extra for the New York Sun and portrayed colorfully the ship in flames and the people floating in the icy water. People heard about it all over the country and Currier’s fame was assured. Thereafter, Currier covered every major disaster, especially fires. These lithographs were followed by the series, now known as Currier & Ives prints, devoted to contemporary subjects that ranged from the familiar to the sensational: scenes of social and domestic life, public disasters, and raids by Native Americans. This enterprise made Currier a national figure. Sometimes the prints were reproductions of well-known paintings like Neagle’s portrait of Dr. Dewees, but mostly the lithographs were drawn by skilled artists and workmen, like Edward Troye and Arthur Fitzwilliam Tait. In the 1850s, Currier promoted the artist James Merritt Ives (1824-95) to partnership in the firm, whom he had employed as a bookkeeper. 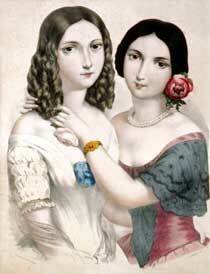 Thereafter all prints published by the firm bore the dual trademark, Currier & Ives. 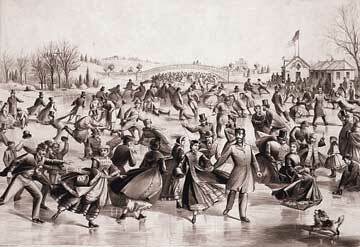 Most Currier & Ives prints were first submitted in the form of sketches or oil paintings. Artists receive about $10 per picture and there were no royalties. Connected with the firm was a staff of specialists. George Durrie was a master at painting snow, rocks and lichens. Charles Parsons excelled as the marine expert. Thomas Worth did African American cartoons. Arthur Tait was the hunting scene artist. Louis Maurer was famous for the horse prints. It was not uncommon for several artists to work on one particular picture, each contributing his particular specialty. Other important Currier prints were the urban scenes such as “Central Park Winter” with the ice skaters dashing about in the New York City park and also the dynamic rural “Early Winter” with the children on the ice. Others included “Preparing for Market,” “Harvest”, Washington Irving’s home at Sunnyside and the “Mill Dam at Sleepy Hollow.” Through the Mississippi River prints, the romance of the American frontier was fully represented. The West and the Gold Rush naturally brought out the “Covered Wagon Print” a glowing picture of the Rocky Mountains while the “Niagara Falls” gave a vivid picture of a national scene. An important function of the Currier and Ives prints was the publication of about five hundred portraits of historical or contemporary characters, including the Presidents. The first five of these were made from Gilbert Stuart’s paintings. 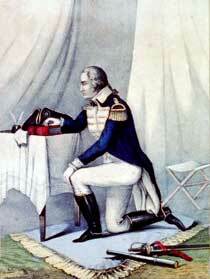 Many episodes in Washington’s career were circulated widely. Trumbull’s historical paintings kept the “Declaration” and the surrenders of Cornwallis and Burgoyne before the people. Transportation of all kinds -- clipper ships, steamboats, steam ships, whalers, yachts, schooners, frigates and railroads -- were visualized through Currier & Ives lithographs. The clipper Comet in a hurricane off Bermuda in 1852 is a renowned example of their work. This group of prints was published parallel to Cooper’s great sea tales, and sprang from the national love for the sea, which in the nineteenth century carried trade all over the world. The Currier & Ives political cartoons were also popular in the nineteenth century. In addition, while not considered innovative from the point of art and nature, were the sentimental and moral prints, considered fit companions of the novels like Ten Nights in a Bar Room or The Wide Wide World. Currier was also recognized as the creator of new lithographic techniques in the making of prints, standardizing the method of production, and greatly refining the marketing of prints. Currier & Ives led the popular picture business from 1840 to 1890 and helped American people become acquainted with their history and country. 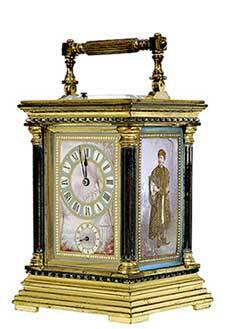 Their colorful and dashing prints, framed in walnut, enlivened the parlors of many. But even in its heyday with a catalog of over 4000 prints, business was mainly dependent on its pushcart customers. After the deaths of the partners, the firm continued until 1907 but improved color printing and photography hastened its collapse. But the Currier & Ives tradition of popular reporting through color prints endures. It was the beginning of American pictorial journalism. 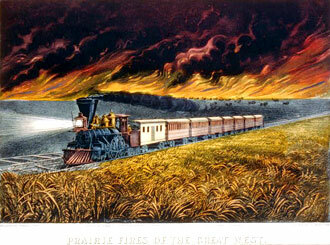 Today original Currier & Ives prints, some hand-colored, are valuable collectors' items.